The next Sony Xperia handset might be about to up the squish factor, if a leaked press teaser is the real deal. The picture appeared on Chinese site Digi-wo and was picked up by XperiaBlog. Depicting a splash of purple across a black background, it appears to show what looks like a shooting star dashing across the night sky. But wait - look more closely! That's actually a phone. In fact, you can even see the power button and volume rocker if you squint your eyes really hard. We'd assume, then, that this is Sony's rumoured next addition to the Xperia line, previously going under the codename of Honami - and now referred to as the Xperia i1. 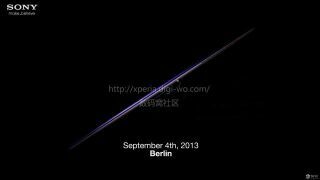 As you can see, the image teases a September 4 date on the bottom with "Berlin" written below it. Sony's IFA 2013 press conference is set for that very date. In Berlin. Go figure. One of the more interesting rumours that's been swirling is that the phone will have a 20-megapixel camera capable of shooting 4K video. A quad-core processor is also expected to appear. As official as it looks, we wouldn't take this as legit until Sony sends these out globally. After all, it wouldn't be that difficult for someone to mock this up.